Building material from an inpatient unit at a Midlands hospital has failed a combustibility test following the Grenfell Tower fire. 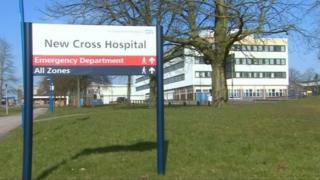 A sample from the Heart and Lung Centre at New Cross Hospital in Wolverhampton failed a test, the trust said. The Royal Wolverhampton NHS Trust said it was working with the fire service. Samples that failed tests from five other providers were from buildings that did not house patients overnight, NHS Improvement said. All NHS trusts and foundation trusts were asked to carry out urgent fire safety checks after the Grenfell Tower fire. NHS Improvements said six NHS organisations had submitted building material samples found to be aluminium composite material [ACM] and subsequently failed a combustibility test. NHS Improvement said after discussions involving the fire service, it "has been decided it is safest and most appropriate to continue to treat patients" in the Wolverhampton unit. It added measures being taken included 24/7 fire warden patrols, changes to some fire safety procedures, increased security and raising staff awareness. The Royal Wolverhampton NHS Trust chief executive David Loughton said after the sample failed the test, it had "since been inspected twice by local fire safety inspectors" who were "satisfied" with precautions the trust was taking. He added: "There are high standards of general fire precautions in the Heart and Lung Centre, well trained staff available 24-hours-a-day and other security measures in place. "We are also working with the fire service and NHS Improvement on additional measures, including enhanced fire warden patrols, keeping vehicles at least 6m away from the premises, increased security and staff awareness and a slight amendment to evacuation procedures." NHS Improvement had previously announced samples from five NHS providers had failed ACM combustibility tests. They were King's College Hospital NHS Foundation Trust, Sheffield Children's NHS Foundation Trust, Newcastle upon Tyne NHS Foundation Trust, North Middlesex University Hospital NHS Trust and University College Hospitals London NHS Foundation Trust.